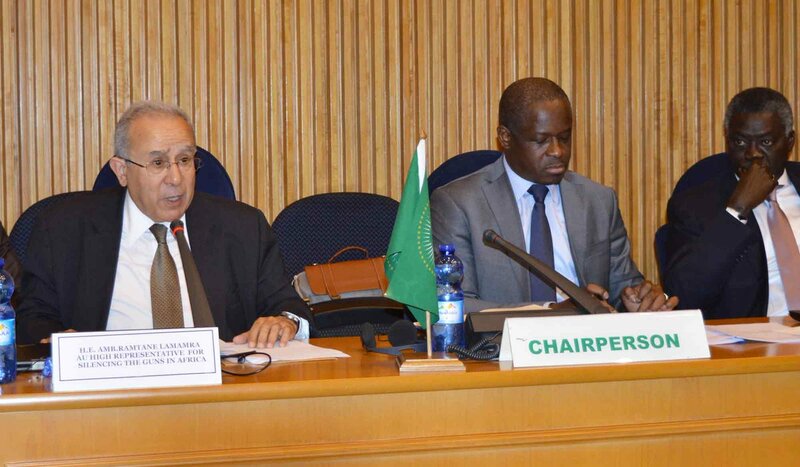 The Peace and Security Council (PSC) of the African Union (AU), at its 824th meeting held on 5 February 2019, dedicated to an Open Session, exchanged views with the AU High Representative for Silencing the Guns in Africa, H.E. Ramtane Lamamra. Council took note of the opening statements made by H.E. Ambassador Hermann Immoungault of the Republic of Gabon, in his capacity as the Chairperson of the PSC for February 2019 and by the Commissioner for Peace and Security, H.E. Ambassador Smail Chergui, read on his behalf by Dr. Admore Mupoki Kambudzi, the AU Acting Director for Peace and Security. Council also took note of the presentation made by the AU High Representative for Silencing the Guns in Africa, H.E. Ramtane Lamamra. Council further took note of the statements made by the representatives of AU Member States, as well as by the representative of the Economic Community of Central African States (ECCAS). Council recalled the AU Vision of an integrated, stable, peaceful and prosperous continent, the Agenda 2063, particularly Aspiration Four, on the building of a peaceful and secure Africa and the 50th OAU/AU Anniversary Solemn Declaration and the AU Master Roadmap of Practical Steps to Silence the Guns in Africa by the year 2020. Council commended the AU High Representative for silencing the Guns in Africa for his relentless efforts, particularly in Madagascar where he facilitated the successful organization and holding of presidential elections, which culminated in a peaceful transfer of power. Council, once again, stressed the importance for all Member States to take effective measures to address in an holistic manner the root causes and drivers of violent conflicts, including marginalization of certain groups in society, poverty, underdevelopment, youth unemployment, corruption and mismanagement of natural resources. Council reiterated the nexus between governance deficits, in particular, diversity management, and violent conflicts in the continent. In this regard, Council underscored the importance of simultaneous implementation of the African Peace and Security Architecture and the African Governance Architecture. Council also stressed the importance of ensuring that all relevant stakeholders commit themselves to the full implementation of the AU Master Roadmap of Practical Steps for Silencing the Guns in Africa by the Year 2020. In this context, Council requested the Commission to expedite the finalization of the Draft Monitoring and Evaluation Mechanism of the Master Roadmap and urgently submit it to Council for its consideration and action as may be appropriate. Council stressed the importance of ownership and leadership of peace efforts on the continent. In this regard, Council welcomed efforts underway in the context of revitalization of the AU Peace Fund and encouraged Member States which have not yet done so to more generously contribute to the Fund. Council underscored the importance of inclusive approaches to promoting peace, which bring on board all relevant stakeholders at all levels of society, including women, the youth and community leaders, as well as the leaders of various religious groups. To this end, Council underlined the importance of popularizing the work of the AU particularly as it relates to the promotion of peace, security and stability in the Continent. Council reiterated the need for effective use of all available tools for conflict prevention, including the Panel of the Wise, Panwise and Femwise. In the same context, Council encouraged all Member States to fully embrace the African Peer Review Mechanism (APRM), with a view to ensuring its universal application. Council also reiterated its conviction that there is urgent need to close the gap between early warning and early action in conflict prevention. Council stressed the need for Member States and the Commission, in close cooperation with the partners, particularly the United Nations, to explore best ways and means aimed at ensuring effective implementation of peace agreements by all parties to the conflicts on the continent. In this respect, requested the Commission to revitalize, in coordination with other actors, the practice of establishing International Contact Groups or Support Groups with a view to galvanizing sustained support in preventing and resolving conflicts and crises in the Continent. Council expressed deep concern over the clandestine activities of some Multi-National Companies, particularly those operating in conflict and crisis areas in parts of the Continent. Council also expressed concern over the growing militarization of parts of the Continent, including in ungoverned spaces in some Member States. Council noted that the illicit flow of arms, particularly small arms and light weapons (SALW), to non-state actors contributes significantly towards exacerbating insecurity and violence in various parts of Africa, thereby undermining social cohesion, public security, socio-economic development and the effective functioning of state institutions. In this regard, Council underscored the need for, Member States to further strengthen their national security capacities to effectively monitor and eradicate the scourge of illicit trade and proliferation of weapons, particularly small arm and light weapons. In the same context, Council emphasized the need for Member States to invest more in building and further strengthening their capacities to effectively safeguard national stockpiles of weapons, with a view to preventing weapons and ammunition from falling into wrong hands. Council recognized that strong political will is a sine qua non condition to facilitate the realization of a conflict-free Continent in line with the AU Agenda 2063 and, therefore, called on Africa’s leadership to mobilize, at the highest level, to carry the Silencing the Guns agenda forward. In this context Council called on Member States to take necessary steps for the successful implementation of the Africa Amnesty Month, at national levels, with a view to promoting the surrender and collection of illegally acquired and owned weapons. Council, once again, underlined the need for full and effective implementation, by all Member States, of all existing regional and international instruments and regimes, including arms embargoes imposed by the United Nations Security Council. In the same vein, Council encouraged all Member States, which have not yet done so, to urgently sign, ratify and fully domesticate all AU instruments relating to the promotion of democracy, human rights and governance and to ensure their universal application throughout the Continent. Council congratulated Equatorial Guinea on its assumption of the Presidency of the Security Council for the month of February 2019 and wished the country success in promoting world peace, security and development. In particular Council, commended Equatorial Guinea for having tabled a draft resolution on Silencing the Guns by 2020, which will be examined at a High Level meeting of the Security Council on 27 February 2019, and called on all the A3 and the African Group in New York to work together, with a view to facilitating the adoption of this landmark resolution on this flagship project of the AU Agenda 2063. Council requested the Commission to take necessary steps towards strengthening the institutional capacity of the office of the High Representative for Silencing the Guns, with a view to enabling him to more effectively implement a successful fast- tracked Silencing the Guns Campaign, in particular, with regard to the strategic and political efforts, as well as the implementation of a Communication and Visibility Campaign.